In-circuit emulator or ICE is a tool for the software for an embedded system. 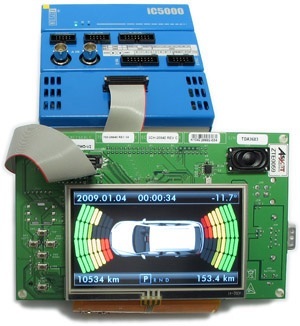 The term is a misnomer, the softwares used for embedded system are analyzers. So, In-circuit emulator (ICE) is very closely related to our specific article on embedded system. For the realization of the in-circuit emulator, there are several ways of implementation. In many cases, a special version of chips needed to be emulated is used. In-circuit emulator (ICE) is usually integrated directly into the control in the development of the software for the controller. This allows not only the recorded command code but also tracks in the source code what the controller is actually doing. Debugging uses high-level programming language and even the dissolution of the operating system data is possible. Normally, In-circuit emulator does the debugging of applications. Since In-circuit emulator can practically get an insight on the “inner workings” of the controller and can influence programatically the counter, stack pointer, status register and related things, the flow of program can be controlled. Since the requests in “real time”, this also enable to analyze problems associated with so-called in-system programmers which are not detectable because they get their data on relatively slow interfaces. In-circuit emulator helps in debugging complex systems enormously. Especially problems with interrupts oddly are relatively easy to track. In-circuit emulator is an specific industry itself. The usage of In-circuit emulator is particularly important for debugging and calibrating professional systems or industrial systems which involves embedded systems. There are various analysis capabilities in these in-circuit emulator prototypes, based on these, in-circuit emulator group are classified. Be it a bigger system or smaller, in-circuit emulators is widely used, as basically in-circuit emulator is based on software, various problems made the latest JTAG based hardware debuggers to replace the older systems. But these JTAG based hardware debuggers are also called In-circuit emulator. This Article Has Been Shared 6082 Times! Cite this article as: Abhishek Ghosh, "In-circuit emulator (ICE) : Brief Details," in The Customize Windows, July 24, 2012, April 18, 2019, https://thecustomizewindows.com/2012/07/in-circuit-emulator-ice-brief-details/.